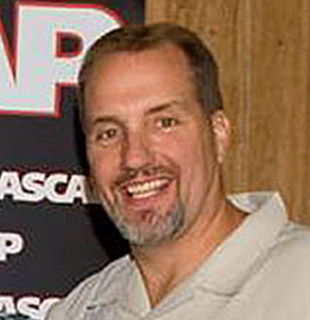 Tom Luteran has been a successful music exec in Nashville for the past two decades. He has worked with many hit songwriters and artists, and has placed songs which became #1 country hits, and set up co-writing sessions which led to big hits. Luteran has also signed several songwriters and artists to music publishing deals, including country star & songwriter, Jamey Johnson. With Nashville being an important place where songwriters can write, network and hopefully sign deals, we thought it would be excellent to speak with a prominent music exec such as Luteran. He discusses his own road to success, and how he decided to move to Nashville from his home in New Jersey. He tells how he moved up the ranks as a music publisher, which led to him becoming a vice president at EMI Music Publishing and now Sony/ATV Music. Here’s a brief summary of Luteran’s job positions and credits as a music publisher. After graduating from Seton Hall University in New Jersey, Luteran decided to move to Nashville in the hopes of working in the music business, even though he had no connections at the time. He secured a temp job at RCA Records, and four months later he landed a music publishing job with an independent company. One year later (in 1996), Luteran became a creative director at Zomba Music Publishing, where he worked for six years. It was in 2002 that he became Creative Director at EMI Publishing, and he was eventually promoted to Vice President of Creative. In July 2012, when EMI Publishing was sold to Sony/ATV Music, Luteran made the transition to Sony/ATV. Currently, he works with such hit writers & artists as Rhett Akins, Thomas Rhett, Drake White, and several up-and-coming writers & artists. We’re pleased to do this Q&A interview with Tom Luteran. He discusses his music publishing career, and some of the hit songs he’s been involved with. Luteran also offers tips to new songwriters, on how they can break into the Nashville music business. Luteran: I’m from the country music hotbed of New Jersey (he laughs). I grew up in the small rural town of Chester Borough (population about 2,500), and my family lived across from a working dairy farm. When your Mom, Dad and a few others listen to country music, as the youngest I did too. I particularly loved Kenny Rogers’ hit, “The Gambler.” My other favorites were Garth Brooks, Travis Tritt and Hank Williams Jr.
After attending college at Seton Hall, I worked doing sales in a couple jobs in New Jersey. But then I decided to move to Nashville to get into the music business. I moved to Nashville (in 1994), not knowing anyone there or knowing about music publishing. I just knew I wanted to work in Nashville and try to get into the creative side of the music business. DK: What was your first job in Nashville? Luteran: I got a temp job at RCA Records, working in their finance department. I did Excel spread sheets for artists’ expenses. I did whatever I had to—I carried the heaviest boxes, ran errands, and I worked at the front desk as a fill in receptionist whenever they needed one. After about four months, I was able to land a job at Music Genesis, an independent music publishing company. This was my first music publishing job—I pitched songs and did other creative work. Then a year later, I got a job at Zomba Music Publishing as Creative Manager. Zomba was a big company in the pop music world (which included Jive Records), although the Nashville office was small. I worked at Zomba for six years. 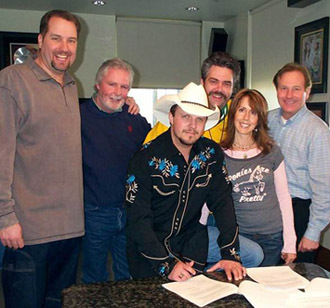 Tom Luteran (left), at Jamey Johnson’s signing event with BNA Records in 2005. DK: When did start working at EMI Publishing? Luteran: In January 2002, I was in the fortunate position to be offered two jobs. Both Mike Whelan (then at Acuff-Rose Music) and Glenn Middleworth (then at EMI Publishing) called me about jobs. I decided to work for Acuff-Rose, which was a hot company at the time. But after a few months there, Acuff-Rose was sold, so I was thankful that I still had an opportunity to work at EMI. In August (2002) I started working there as Creative Director. DK: What were some of your highlights working at EMI Publishing? Luteran: In 2004, I signed Jamey Johnson to a publishing deal with EMI. One of the EMI writers I worked with, Arlis Albritton, said to me, “Man…You’ve got to hear this guy, Jamey Johnson.” Jamey came to my office and played me his songs, and I my jaw hit the floor! I was blown away. Jamey has been with EMI, and now with Sony/ATV, ever since. He’s amazingly talented—he’s like the Willie Nelson of our generation, because he’s an excellent artist and he can write songs for other artists. He’s a true Renaissance man. In addition to signing writers, placing songs and setting up co-writes is a big part of my job. In 2005, I was able to pitch the song “Honky Tonk Badonkadonk,” which became a big hit for Trace Adkins. I pitched it to Autumn House (A&R exec at Capitol Records) and she gave it to Trace. Other hit songs which I placed are “All Over Me” for Josh Turner (in 2010), and “Honey Bee” for Blake Shelton (in 2011). More recently, I pitched the song “When She Says Baby” which became a #1 for Jason Aldean, and the song “21,” which is Hunter Hayes’ new single. DK: Do you have some good stories about how you placed songs with artists? Luteran: There’s a funny story about how I pitched the song “Ladies Love Country Boys,” which was a #1 for Trace Adkins (in 2006). 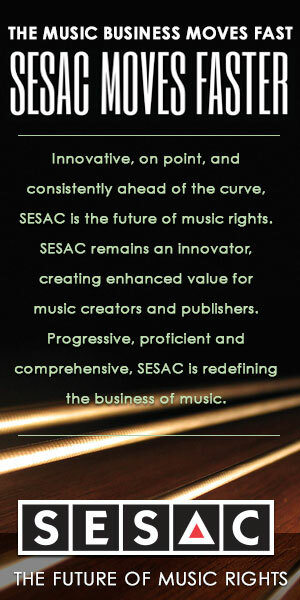 When I worked at EMI, we had a co-venture with Sea Gayle Music Publishing, which was in the building next door to us. One day, Liz O’Sullivan (creative exec at Sea Gayle) told me Trace was at Sea Gayle, meeting with producer Frank Rogers and listening to songs. I quickly ran over to Sea Gayle and slid a CD of the demo of “Ladies Love Country Boys” under the office door where Trace and Frank Rogers were meeting. As it turned out, they heard the demo and decided to cut this song. Setting up co-writes is integral part of publishing to put your writers in great spots. Rhett Akins has been one of the hottest writers in town for years and writes with the best of the best in town. I was talking to my former co-worker Missy Wilson and we talked about Rhett writing with one of their new writers, Jimmy Robbins. One of the best things about Rhett is he will write with talented people even if they are new. She said Jimmy has a studio near Nolansville Road, would Rhett go over there and knowing him I said sure. Jimmy, Ben Hayslip and Rhett wrote “It Goes Like This” that day. Rhett played it for Thomas Rhett and it was Thomas’ first # 1. Rhett had known Michael Carter for a bunch of years prior to the Sony/ATV/EMI merger, but they had never written. I booked a day through my co-worker Abbey Adams with Michael and Cole Swindell with Rhett. They wrote “Get Me Some Of That.” Rhett again played it for Thomas Rhett and it became his second #1. Bart Butler has been my friend since I moved to Nashville. He said I got this guy who is a great guitar player, Larry McCoy and we love writing with artists. I set a day for them to write with Thomas in early 2011. They wrote “Make Me Wanna,” Thomas’s third #1. So there can be lots of different ways to build bridges between writers and artists to get songs recorded. Tom Luteran and his two daughters, with Thomas Rhett and Rhett Akins. Pictured (l-r): Tom Luteran, Molly Luteran, Thomas Rhett, Rhett Akins and Erin Luteran. DK: Over the years, who are some of the hit writers that you’ve worked with? Luteran: I’ve been blessed to be able to work with a lot of great writers. I’ve worked with Rhett for the past seven years. He’s as hot as a writer can get. I also worked for a decade with Kelley Lovelace (who’s co-written many hits for Brad Paisley), and I work with (hit artist & writer) Thomas Rhett. I also work with Drake White, who’s signed as an artist to Dot Records (via the Big Machine Label Group). Drake is an amazing singer/songwriter. I’ve worked with the Warren Brothers (Brett & Brad Warren). They’re two of the most talented people, and they’ve been writing songs at a high level for a long time. I’ve also worked with many others during my tenure. DK: Currently, are you working with some newer writers and artists that you’re excited about? Luteran: Yes. There are some great songwriters who are also artists, who are up-and-coming. I have a band called Radio Romance. We also have Jon Langston, Murphy Elmore, Keith Smith and Mitchell Tenpenny, who are talented artists & writers. Another excellent writer is Jody Stevens, who has a couple songs on Luke Bryan’s upcoming album, including the title cut. DK: There are many songwriters who will be reading this article, who are hoping to break into the Nashville music business. Do you have any advice for them? Luteran: Songwriters have to treat themselves in the same way that artists treat themselves—you need to differentiate yourself, to find your own way. As a songwriter, you need to write songs which stand out melodically or lyrically. Your songs need to be different, but stand out in a way which still fits the country format. Luckily, the country format has gotten a little wider in recent years, so there’s more room to be unique. It’s important to be in Nashville—you’ve got to live here. You can’t do it from long distance. Networking is also a huge part of succeeding in Nashville. Everyone knows somebody, and you never know when you’ll meet someone who will open a door for you in the business. Hang around where other songwriters hang out. There are many different clubs and bars you can hang out, such as the Bluebird Café, the Listening Room or dozens of other places. Also, you should become a member of one of the PROs (performing rights organizations like ASCAP, BMI or SESAC) and find someone there who will champion you. If someone from a PRO calls me and recommends a new songwriter, I will take a meeting. Due to our company policy, we can’t accept unsolicited material. The biggest thing is to listen to the radio. You don’t want to copy what’s on the radio, but at least know the general parameters you’re working in. Part of being a professional songwriter is knowing country radio. You can’t come to Nashville and expect to have success if you don’t what’s happening, if you’re not up on country music. Do your homework and know what’s working on country radio.